Trying mounted archery at Misty Meadows. 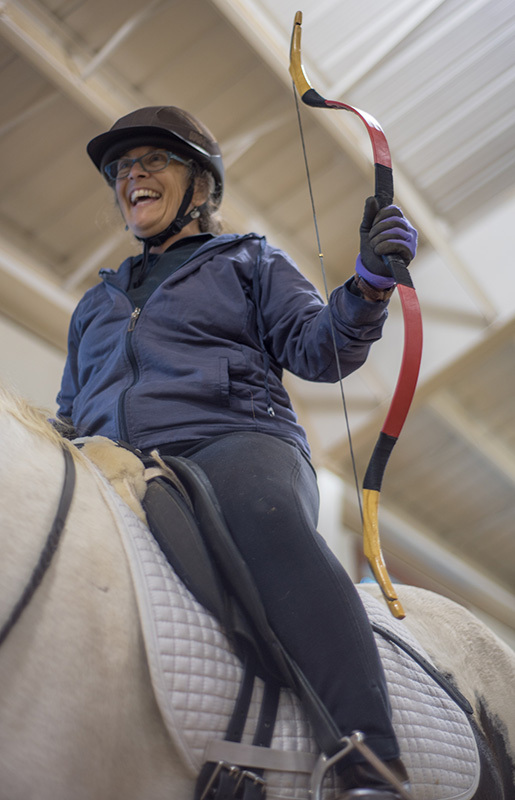 A new sport, mounted archery, began officially on the Vineyard this fall. 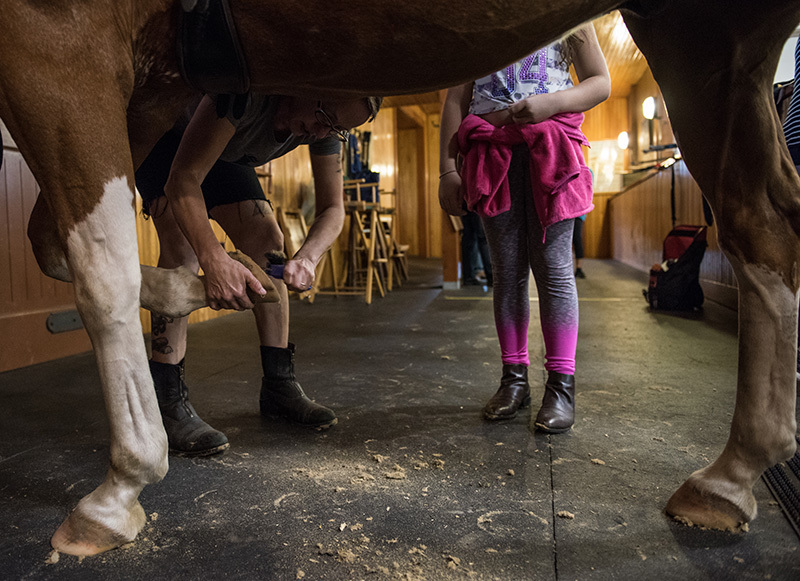 Two programs are underway at Misty Meadows Equine Learning Center, each lasting six weeks. 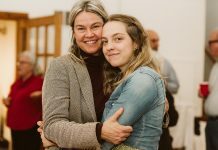 Junior and adult clinics currently have eight students each. Mounted archery dates back at least as far as the Mongols, and this martial art was practiced by knightly culture during the Middle Ages. The indoor arena at Misty Meadows is set up with a circular course for mounted horses, and an area for shooting at targets from a standing position. After the students are good at it, they graduate to bows and arrows. 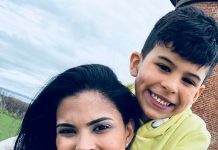 It’s important to learn how to shoot arrows at targets from either side as well as from behind, which is called the Parthian shot after an ancient Persian group. While two students at a time take turns riding the track, the others improve their skills at hitting targets standing, again in all three positions. 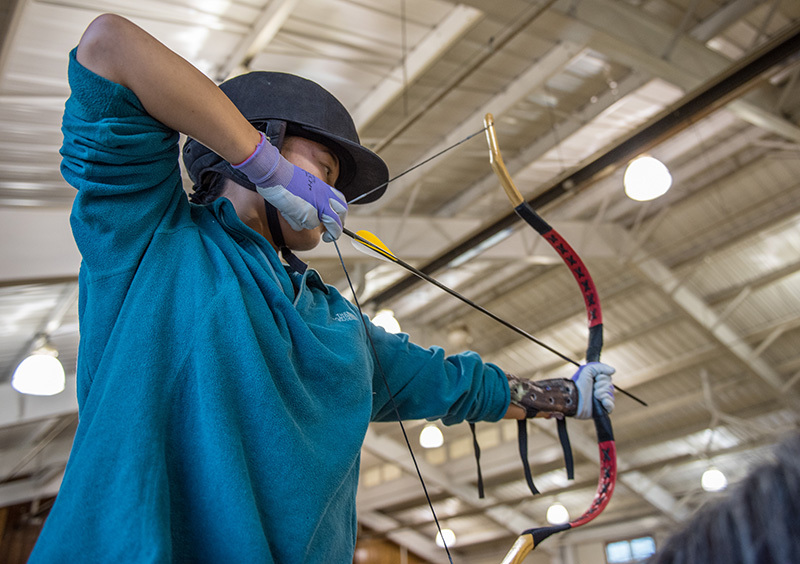 They begin with a big rubber band, then learn the shot sequence of stance, gripping the bow, and hooking the string, then setting posture and alignment, drawing back, putting bowstring and arrow under the chin. The next step is to transfer weight from the arm to the back muscles before shooting. “I got into this in 2013, when my husband, Jeremy Jones, started riding a bit and wanted to do it,” Parsons says. “We bought a couple of bows and played at it. 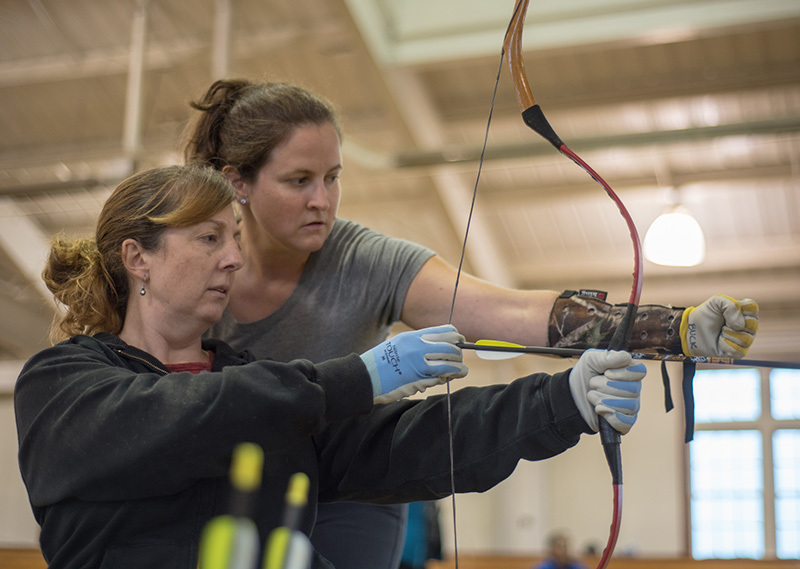 Then he injured his shoulder.” He has since returned, earning his Level Two Certified USA Archery Coach status. 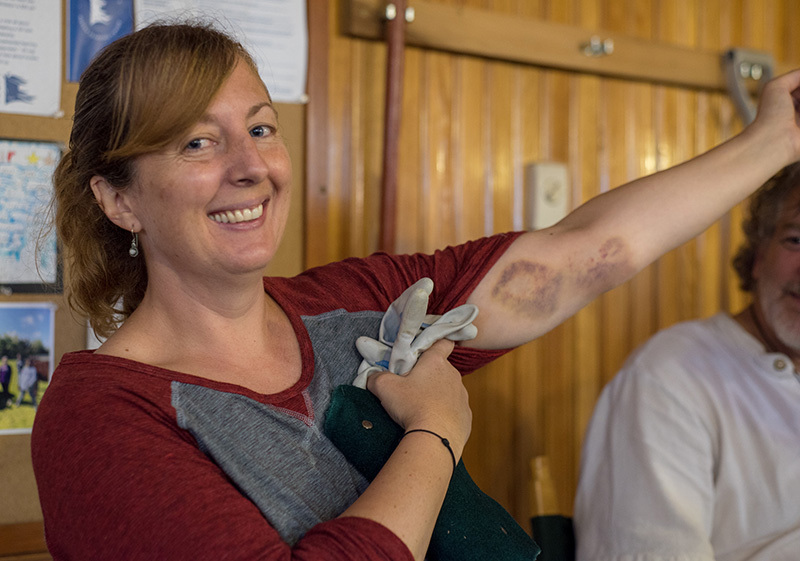 Parsons, who has also sponsored horse surfing since 2013, continued for a year and a half on her own, deciding eventually to do a clinic with a coach in Vermont, who then came to run a clinic at the center: “Last year I asked Misty Meadows if we could set up a pilot program to see if people were interested.” Very supportive of the idea, the administrators at the center agreed, and the clinics were popular from the start. The kids range in age from 11 to 14 and up, with a mix of boys and girls. One of the games they play is tic-tac-toe with the arrows, which helps with their aim. Once students have completed the course, they can practice, and move onto competitions. Two of the competitions are Barn Wars and Postal Matches, where they are videotaped performing. 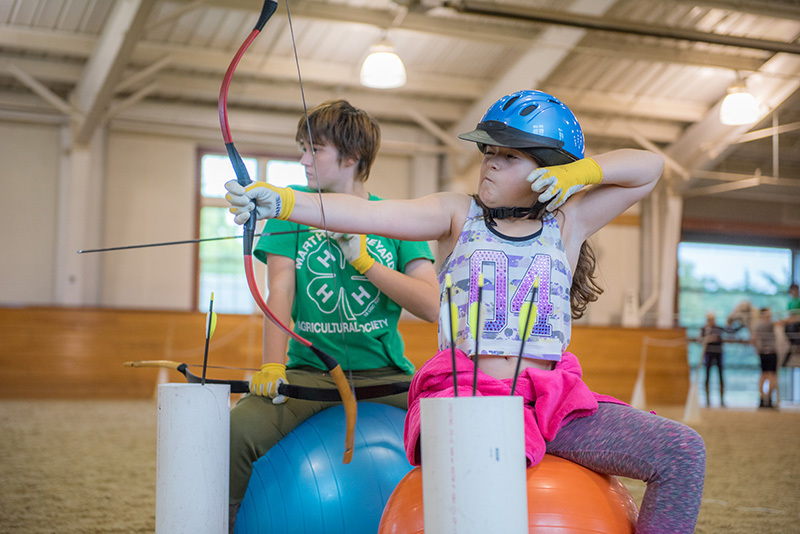 Eleven-year-old Elaina Cacchiotti from Oak Bluffs joined the class, she says, “because I like archery.” She learned the sport at Girl Scout camp. Elaina participated in her first mounted archery competition this summer, and came in fifth out of 50. A future possibility? Competitions at Misty Meadows. 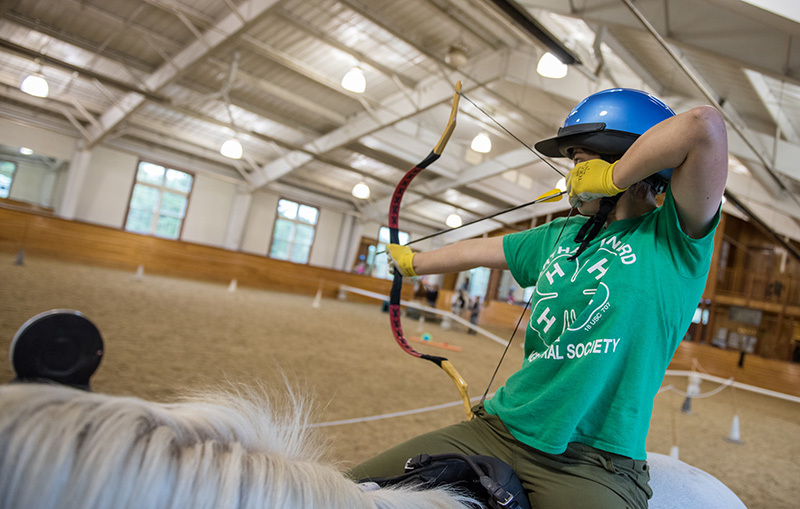 For more information about mounted archery, contact Misty Meadows at 508-338-7198, or Annie Parsons at 508-560-0655.